Avenged Sevenfold News: "The most promising thing about Hail to the King: Deathbat is that it’s obviously been a labor of love for M.Shadows"
"The most promising thing about Hail to the King: Deathbat is that it’s obviously been a labor of love for M.Shadows"
Popular heavy metal band Avenged Sevenfold has been working on their own dungeon crawler for the last couple of years, and the results are a lot more impressive than most would probably expect. No, seriously, this is actually a thing. Hail to the King: Deathbat is the brainchild of lead singer, M.Shadows. This is no mere town builder or casual-friendly hack-n-slasher, however; it’s meant to be a throwback to a bygone era, when games didn’t coddle their players and the only way to advance was to get better at playing. According to M.Shadows it’s been quite the experience to take the game from an idea to an almost ready to release product. The game has gone through several iterations for optimization and tweaking, but it’s finally nearing release and it’s looking pretty neat. The visual’s have a very ‘dark fantasy’ feel, and the music is appropriately moody but also carries just a hint of retro charm. At first glance it looks similar to other action-adventure games like Diablo, but it’s far more ‘Classic’ than that. Players won’t be leveling-up or upgrading skill trees; instead they’ll be gathering and purchasing brutal weapons and unlocking powerful magic spells. In action it feels more like playing an older Castlevania, really. You’ll be dodging traps, timing your attacks against enemies, learning boss patterns, and all that other good stuff. 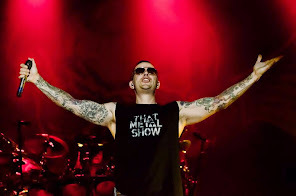 Perhaps the most promising thing about Hail to the King: Deathbat is that it’s obviously been a labor of love for M. Shadows. I’ve spoken to card-carrying game developers who weren’t as enthusiastic about their work as he is about this game. Hail to the King: Deathbat should be coming to the App Store soon for $4.99. Additional in-app purchases are available to unlock members of the band as a sort of “easy” mode, but aren’t necessary to progress. Not unless you’re really bad at video games, anyway.